Elle has a PET scan tomorrow morning and then it is back to MMC for chemo. We won't know what chemo drugs she will be taking, or the schedule for them, until we reach the hospital tomorrow. What happened is that there was some regrowth in the tumor. And that is become some of the cells in the tumor became chemo-resistant to the VAC and Doxo/Cisplatin regimen that was being used. And those cells began to grow. There was really no way to catch it before they did. And it was a silver lining of sorts: the CT scan in Boston that caught the growth was a last-second decision. And had the surgery been performed with the tumor growing...it wouldn't have been good for Elle. So while this setback is disappointing, Elle is still raring to go and so are we. The chemo is just the first step. And we WILL beat this thing. 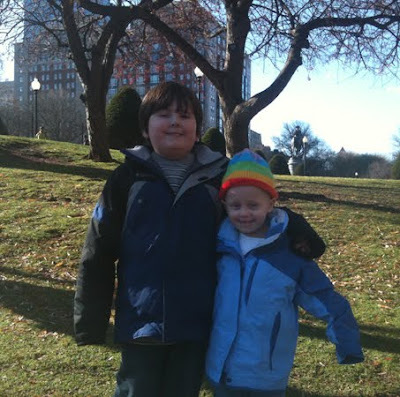 And just so you can see how well Elle is doing...here is a pic of Elle and Davey in Boston at the Public Garden. I made a special trip to get Davey so the whole family could spend our (early) last night in Boston before we came back to Maine. This was taken right before we left the next morning. Prayers continue and will help!